Throughout the past week, unhoused folks, who some call the Survival Sleepers, have defied the latest drive-em-out edicts of City Manager Martin Bernal. Other activists are planning protests at City Council next Tuesday. Bernal has refused to answer simple questions about his newly posted signs. Mayor Chase in a recent interview refused to put the issue on the May 23rd Agenda for Public Discussion and Vote. “Survival sleepers”, a group increased with numerous elderly and disabled men and women refugees from the closed Winter Shelter program–have been sleeping on the edges of City Hall for nearly two months now. “Bums Begone!” Bernal locked the previously-open City Hall bathrooms and then used complaints of poo poo and pee pee found on the grounds to justify a “no trespass” order. The City hall has been traditionally public space, not to mention the center of government where folks thought they had a First Amendment right to gather peacefully to seek a redress of grievances. The population of folks staying there overnight have been driven out of other areas where the act of sitting and lying down, day and night, is frequently treated as a crime. Many of these folks are elderly and disabled–with no emergency shelter, no nighttime bathrooms, spotty daytime meals, and shrunken services. Santa Cruz’s unsheltered population (the City alone) is 1000-2000. The overwhelming majority don’t even have temporary shelter under recent “Smart Solutions” and “compassion fatigue” that seek to make Santa Cruz “less welcome”. The Homeless (Lack of) Services Center [HLOSC], for instance, discontinued emergency services 2 years ago (such as shelter and food) under the grant-grabbing a “Pathway to Housing” requirement. The HLOSC now looks like a low-intensity prison camp with gates, fences, security patrols, ID cards, and a “move along” attitude. The two-year long Freedom Sleeper campaign to end the City’s 11 PM to 8:30 AM anti-homeless Sleeping Ban has pressured the City into abandoning MC 6.36.010a tickets for sleep at least in front of the sidewalks at City Hall on Tuesday nights when they gathered in small but persistent numbers. With police driving away unhoused folks from the protective corridors outside City Hall into the rain and wind over the last month, the Survivor Sleepers have taken to the sidewalks as well. Mauro Garcia’s eager Parks and Rec Rangers have beefed up Bernal’s expansion of the Homeless Ban at City Hall by seizing and reportedly destroying property. Police say they don’t destroy it, but rather hold it for pick-up during the extremely limited 12:30-2 PM hours Tuesdays and Thursdays; Dreamcatcher, a homeless artist, reported police stored his material out in the rain, making much of it unusable on when he finally threaded the police pick-up maze after 4-6 weeks. Attorneys in the Bay Area are currently suing Cal-Trans and other police authorities for routine and wanton destruction of homeless survival gear. In the Kinkaid decision in 2007, Fresno homeless activists wrested $2.3 million from the City and secure an Injunction against such organized vandalism. Rumors are spreading that hitherto dormant attorneys from the National Law Center on Homelessness and Poverty from Washington, D.C. may again be setting their sights on Bernal’s latest Bumblasting crusade. 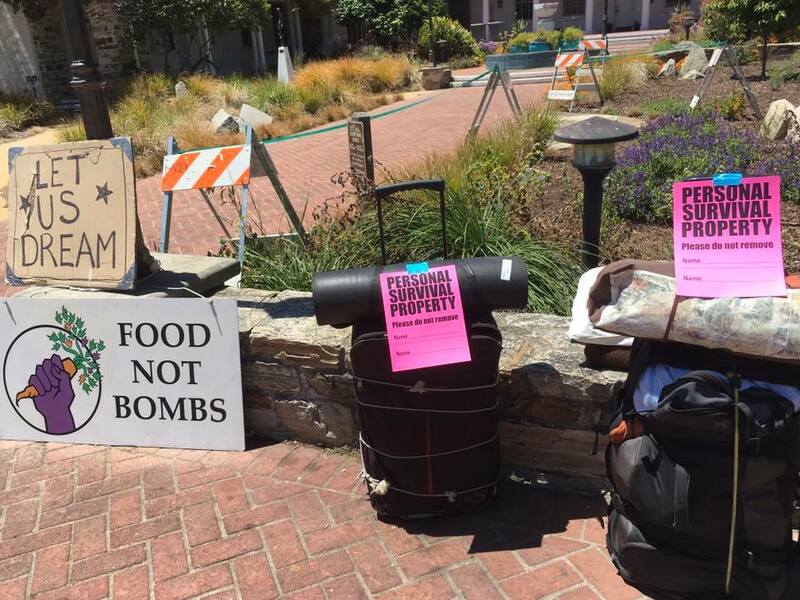 Activists are also planning to reappear at City Hall Tuesday at 1 PM to greet UCSC’s Chancellor Blumenthal and his City Council enablers in a joint protest against the Sleeping Ban harassment, rent profiteering, housing famine, and other penalties for poverty. An earlier protest several weeks ago filled City Council chambers with ringing denunciations from the adjacent protest just outside. Mayor Chase confirmed in an interview me for Free Radio on Monday that she would not be putting the anti-homeless Signs on the City Council agenda for May 23rd. Go to http://radiolibre.org/brb/brb170518.mp3 [52 minutes into the audio file] for the full interview. Her promises to reply to concerns raised during the interview around opening bathrooms and other issues have so far gone nowhere. A Chase subcommittee previously introduced a “compassionate study” of homelessness dismissing any change in Santa Cruz’ anti-homeless law on May 9th with no specific budget commitments for shelter, storage, or homeless services whatsoever. Chase assured me with a smile that such matters would be fully dealt with in budget hearings beginning May 23rd. In response, Freedom and Survival Sleepers have called emergency meetings and set up a Daytime Storage Table to document any thefts of homeless property and false arrests there by cops, rangers, security guards, and other city personnel. Early reports indicate renegade rangers are backing off under methodical observation, angry defiance, and increased posting of their raids on you tube. Sleepers urge interested community members to volunteer for brief daytime shifts to safeguard homeless property, join developing protests against staff homeless abusers, and broaden the call for deeper change. To stay current with the situation, go the facebook page of the Freedom Sleepers, Keith McHenry, or Santa Cruz Food Not Bombs. Rumors abound that the protests may spread to the sidewalks in front of certain notoriously anti-homeless City Council members’ houses to invite public dialogue. Stay tuned! This entry was posted in HOT ISSUES and tagged Homeless, Local Police repression, Protests, Sleeping Ban by huffsantacruz. Bookmark the permalink.